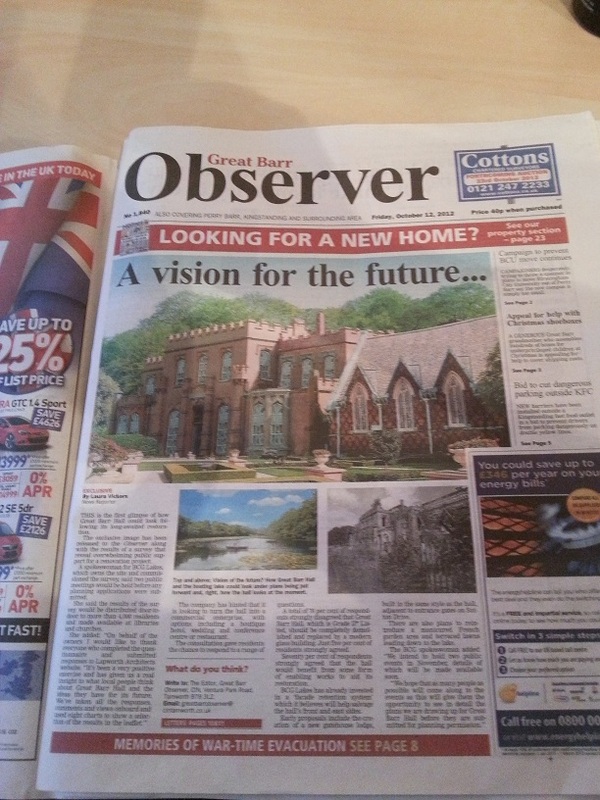 Anyone who has seen today’s Great Barr Observer will have seen the vision of the ‘NEW’ Great Barr Hall. We now know the new company to be running this project is called BCG Lakes and they seem to be proposing a Hotel and conference centre. They will run roadshows in November to present plans and take feedback. Along with this they issued some of the results of the questionnaire. It shows 76% what the Hall to be restored against only 5% for it to be demolished. The good news is that the full results of the Questionnaire will be released to the residents of Pheasey Park farm. However in this piece no costings were released. As I posted before I know it cost £4M to restore the Holte Pub at Villa Park (also a Grade 2 listed building) to it’s former glory. these plans are expansive and would be very expensive. I would think approaching £50M plus. It is only fair we ask the one question that has yet to be addressed. 1) How much will this cost and how will it be funded ? When we get the answer to this then we can see if the words and pictures live up to the deeds. October 12, 2012 in news, Pheasey. In theory,this looks like the residents dream come true. In practice,how on earth are they going to fund it ??? Unless BCG Lakes are a consortium of mulit millionaires/billionaires then it is incredible to think that this renovation is feasible. I for one would love to attend the meeting in November to see what the plan is.I sincerely hope they can do this because it would be sacriledge to see the building die. agree Marie but business people also want a return on money spent, remember they picked it up at rock bottom prices. The amount needed for this rebuild would need money from many sources, private, public etc. Maria ~ have you seen the state of Great Barr Hall, because it was sacriledge to allow this building to for fall into disrepair in the first place, and who is to blame for that ~ the previous owners. Great Barr Hall isn’t a Grade Two listed building, it’s actually a Grade Two Star listed building. That may not seem a great difference to some observers, but in conservation terms, it’s actually an important distinction to make. You’re not alone in listing GBH at a lower level, the Great Barr Observer for example have on more than one occasion given the Hall the much less significant ‘Two Star’ grading. Or rather, the Great Barr Observer have given GBH the lower ‘Grade Two’ listing on more than one occasion. I’ve had a look at the architects website, http://www.lapwortharchitects.com , and they seem to have a good track record in conservation. Knowing that the owners have appointed a firm with relevant experience has increased my confidence in their plans coming to fruition. I see that we have another couple of comments from anonymous individuals very much in favour of the BCG/Lapworth proposals; one on this site from ‘Albert’ (complete with yet another link to the Lapworths website. Ho hum); and one in this weeks Great Barr Observer, from ‘Zoe’. We had BCG’s/Lapworths ‘Community Consultation results’ leaflet pushed through our letterbox today; and the item of undoubtedly most interest to the good citizens of Pheasey/Park Farm sits near the top of page 2, the proverbial ‘elephant in the room’, the mention of ‘enabling works’ in relation to the proposed restoration of Great Barr Hall and it’s surrounding woodland/parkland. Everyone involved locally in the fight to prevent all development in Great Barr Park since the 1980’s are well aware that ‘enabling works’ almost invariably means unwanted housing development; and usually in green areas such as Great Barr Park. According to BCG/Lapworth; a response to a question relating to ‘enabling works’ in Great Barr Park, showed that a large majority of ‘local people’ strongly agreed that there would be benefits from some form of ‘enabling works’ to restore the Hall and Park, with apparently no one ‘strongly disagreeing’ with that position. Which seems fairly unbelievable to me, taking into consideration the widespread and vociferous local opposition the last time housing development (the Bovis development) was proposed for the Park. If BCG/Lapworths put in a planning application to Walsall MBC for (further) housing development in Great Barr Park at some point in the near future, i would certainly expect widespread local opposion to any such application. Thanks Steve for bringing this very loose statement of ” enabling works ” to our attention. I firmly believe that BCG should clarify EXACTLY what is meant by this . I was not aware of this statement and I don’t know what precisely it means . I’m pretty sure that the majority of local residents don’t either ! Oh and by the way…..I did NOT receive the leaflet through my door sadly. Come on BCG / Lapworths come clean please. It’s good to have another ‘real’ local resident on here and not yet another anonymous individual (in an ever growing line) praising the BCG group and claiming to be a local resident. ‘Enabling Works’ in relation to situations such as we currently have in Great Barr Park, usually mean that a developer will make an application, for example, to build a number of houses and state that some of the funds raised from their eventual sale will be ring fenced for, let’s say, refurbishment/restoration of an at risk area or listed building. Of course any local Council agreeing to approve planning permission for such a scheme; and the existing local residents living near to any such proposed development are at risk, for example, of the developers building and selling the houses and then filing for bankruptcy before the promised ring fenced monies from the sales of the new homes are used to refurbish/restore the at risk area/property. Leaving US (if that scenario should occur here) with yet more unwanted and very unwelcome houses in OUR park; and Great Barr Hall still very much at risk. Basically, if BCG don’t have the necessary funds to restore and refurbish Great Barr Hall and the area of parkland they currently own without proposing to build more housing in the park (i.e. ‘enabling works’); then they should put the Hall and it’s surrounding parkland back up for sale. I’ve no idea how wide the area BCG/Lapworths are currently leafleting is, so you may receive the leaflet we received here yesterday at some point in the near future. Point of fact it has never been OUR park for many years. So Steve despite your comments how would you propose that the park and hall gets the ten of millions that are needed to restore it. You say the current owners should sell it, who to ? it had been on sale for many many months, the price dropped on at least three times who do you think would take it over, spend millions and get no returns. Lets not under estimate this eh ? This is the last chance for the Park and Hall and if you say no housing you must propose how you would do it otherwise or you would be accused of hot air and no substance. So yes campaign away on a no housing whatsoever platform that is your right, other people’s rights will be to ask you what your alternative plan is ? Unlike you I retain an open mind until we see the promised roadshows this month and the detailed planning submissions. Not ‘if i say no housing’; Absolutely no more houses in Great Barr Park is exactly what i said back in the 1980’s; and that’s still my position today. And it won’t just be myself that will be fighting more development in OUR park; Many local residents in Pheasey/Park Farm will again fight against any development, the Walsall branch of UKIP will fight against any development, as will local UKIP MEP Mike Natrass; as i’m sure will the Pheasey Park Farm branch of the English Democrats. It’s not down to me to ‘have an alternative plan’, to propose how monies will be raised to refurbish the Hall and the surrounding parkland, no one locally is seriously really going to expect that. All i’m proposing to do is to stop any and all further desecration of OUR park. No more brick, glass, paving slabs, tarmac etc. I’ve no idea who BCG should sell the Hall and the parkland to, should they choose to do so; why should i?????? – All i’m concerned with is keeping yet more unwanted development, i.e. housing, out of the park, period!!!!!! Steve, come on, you say one route is closed off in your mind you have to have an alternative to remain credible, anyone who says no has to. Peter Allen and Bob Winkle have stated their alternative publically. We in the Labour Party will see what the plans are before commenting, not sure the three Councillors have stated a preference as far as I know (Mike Bird can not as he is on the planning committee). For decades missed chances have come and gone, this is the last chance to save and restore the area. Who is to say they want housing, we have not seen the plans. If the plans come up with no housing there is no real issue is there ? If they do then the reality of the choice is that the area goes back to how it was and worse which will disturb people as it used to. I almost missed your comment at the foot of your response; (‘Er’) ‘unlike you i retain an open mind’ ????????? There have not, as far as i’m aware, been any planning proposals regarding Great Barr Hall and Park submitted to Walsall MBC, by BCG, so prey tell how could i have a closed mind to a non-existent planning proposal, that of course i cannot comment on, as it has not yet materialised? Erm, no actually, i don’t have to do or say anything. I will do and say exactly as i see fit. If BCG’s/Lapworths proposals do not include any more house building inside Great Barr Park, well great. A refurbished Hall and a sizeable portion of the parkland with absolutely no more concreting over of the green belt would be fantastic; and of course then i agree with you, there would be no issue with regard to BCG’s plans. Hello to both Steve and Ian. I can see this topic is going to raise some very contentious points ! Thanks Steve for explaining ” Enabling works” to me. Was this not a similar idea that Bovis shafted us all on ? Yes ,I AM a genuine resident of Park Farm Estate and a very concerned one at that.The status afforded re preservationof the Hall should be fully acknowledged and adhered to. God help the local infrastructure if any more houses go up around here.It will collapse under the pressure.I will give my vote to the party that can deliver on the desired future of this much loved park and house . I fully understand the difficulties of raising the capital for restoration but surely there has to be some other option other than more bricks and mortar ? All ideas gratefully received !! The park was very ‘conveniently’ split a number of years ago, obviously to make the area of the park without Great Barr Hall inside it, of greater interest to developers not keen on having to agree to set aside funds to restore the hall through ‘enabling works’. Bovis Homes purchased the land without Great Barr Hall inside it, so the matter of enabling works in relation to the Hall did not arise with regard to their eventual planning application. Other developers down the years have suggested enabling works in relation to restoring the Hall. Clearly, i’d say your thoughts on the issues of already overstretched local resorces and infrastructure; i.e. Doctors and Dental Surgeries, Primary and Secondary schools, very busy roads, car parking around local surgeries, shops and other businesses, our shrinking green belt area etc etc; reflect my own thoughts on these topics and the thoughts, i’m sure, of many of our neighbours across Pheasey/Park Farm. We need more house building in our suburb like we need holes in our heads. No thanks!!!!! Like yourself i would be only too happy to see Great Barr Hall and the surrounding parkland refurbished/restored without having to resort to more houses being built within the area of the park to pay for it. Hi Steve,many thanks for clarifying the situation re Bovis and the Hall. I am happy to stand corrected on this. I note with interest your comments re the next election and agree with your E.U. comments ! I look forward to the day we escape those particular shackles ! Thanks again and also thanks for keeping us all up to date with the progress of the Hall.